The seventh Orbital ATK OA-7 Cygnus cargo vehicle took to the near-perfect morning skies above Florida atop a United Launch Alliance (ULA) Atlas V rocket. The mission, named in honor of American spaceflight legend John Glenn, is sending some 7,500 pounds (3,400 kilograms) of cargo, crew supplies and experiments toward the International Space Station. Liftoff took place at the beginning of a 30-minute launch window at 11:11 a.m. EDT (15:11 GMT) April 18, 2017. 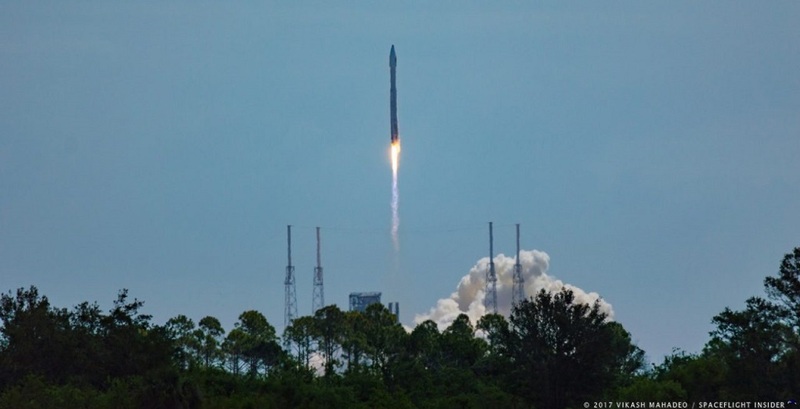 The Florida skies, which were blue with puffs of clouds, presented no problems for the launch, which had an estimated 90 percent chance of acceptable conditions. The Atlas V for this mission was in the 401 configuration. This is the lightest version of ULA’s venerable Atlas V series, comprised of only of the RD-180-powered Atlas booster for its first stage and an RL10C-powered Centaur upper stage. However, given that the Cygnus spacecraft and its cargo was only 15,928 pounds (7,225 kilograms) going to low-Earth orbit, the vehicle was more than up to the task. The rocket was assembled in the Vertical Integration Facility on the morning of April 17. It was vertically by rail to Space Launch Complex 41 where it was hooked up to the pad’s ground support equipment. Fueling began just over two hours before launch. The first stage was filled with rocket grade kerosene (RP-1) and liquid oxygen (LOX), while the Centaur upper stage was filled with LOX and liquid Hydrogen (LH2). A few seconds before launch, the RP-1 and LOX-powered Russian-built RD-180 engine powered up and ignited in a bright orange flame. Once the engines were at full power, the launch mount released the rocket and it was propelled swiftly past the service tower into the Florida skies. Atlas V gets going in a hurry, reaching Mach 1 after just 1 minute, 22 seconds and burning out completely some three minutes later. Stage separation occurred at 4 minutes, 21 seconds. The Centaur’s LOX/LH2-burning RL10C engine ignited about 10 seconds later. The RL10C took Cygnus the rest of the way to orbit, burning out 18 minutes, 12 seconds into the flight. “Congratulations to our mission partners at Orbital ATK and NASA on another successful launch that will help advance our scientific knowledge on Earth and in space, and inspire the next generation of space explorers,” Wentz said. Cygnus then separated a couple minutes later, some 21 minutes after leaving Florida, to fly on its own. The spacecraft will spend about four days catching up to the ISS. Rendezvous and berthing is expected to occur April 22. After payload separation, Centaur ignited a second time at 48 minutes, 30 seconds into its flight to ensure it splashed down in the ocean 1 hour, 7 minutes after liftoff. When Cygnus arrives at the ISS, it will be grabbed by the stations robotic Canadarm2, which will be operated by the crew of Expedition 51, at about 6:05 a.m. EDT (10:05 GMT). The arm will then move the freighter to the Earth-facing port of the Unity module. Once attached and leak checks between the hatches of the station and spacecraft are conducted, the crew will open the hatch and begin unloading the cargo and experiments. The spacecraft will remain at the orbiting laboratory until July, when it will be loaded with unneeded equipment and detached for eventual burn up in Earth’s atmosphere. Before the OA-7 Cygnus’ final plunge in the atmosphere, it will perform one more experiment at a safe distance from the ISS and its crew. The SAFFIRE III experiment, the third in NASA’s series of tests to study the spread of fire in space, will be conducted. Once the experiment is finished, the data will be remotely downlinked to the ground. The launch of the OA-7 mission marked the third ULA mission in support of ISS cargo resupply. It was the 71st Atlas V launch. The S.S. John Glenn will be the seventh Cygnus cargo run to the station as part of Orbital ATK’s $1.9 billion Commercial Resupply Services contract with NASA. The next Cygnus flight, OA-8E, is planned for October 2017. It will launch atop Orbital ATK’s Antares 230 rocket. ULA will launch its next Atlas V rocket Aug. 3, 2017, from the same pad. It will use the 401 configuration to send the next Tracking and Data Relay Satellite, TDRS-M, into space for NASA. Orbital ATK has launched a new cargo resupply mission to the orbiting International Space Station (ISS) on behalf of Nasa from the Space Launch Complex site at Cape Canaveral, Florida, US.As part of the mission, Orbital ATK's Cygnus spacecraft was launched, along with more than 7,600lb of cargo, including food, clothing, crew supplies, spare parts, laboratory equipment and scientific experiments.